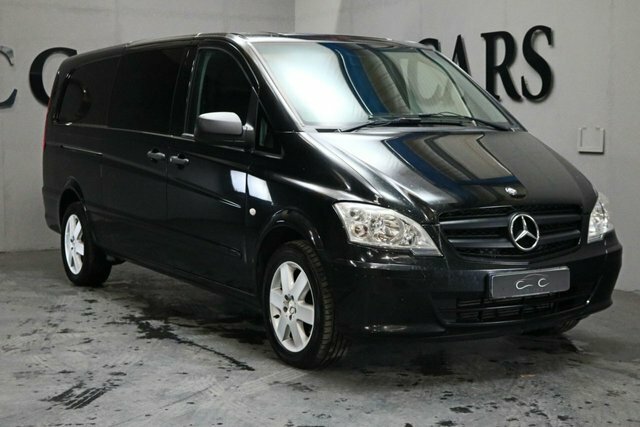 This 5 Seat Mercedes Vito is the Second Generation Facelift Model with a More Efficient Engine, A Smarted Cabin and Increased Payload Capacity. This Spacious Medium Sized Van Includes Bluetooth Connectivity, Air Conditioning, 17 Inch Alloy Wheels, Leather Multi Function Steering Wheel, Privacy Glass, Cruise Control and Automatic Lights. Under the Bonnet is a 2.1 Litre Four Cylinder Diesel Engine that has Gained a Good Reputation for its Combination of Performance, Economy and Refinement, it is also Fitted with Balancer Shafts to Eliminate Vibration and Create Smoother Handling. An Excellent Example with Relatively Low Mileage. Incredibly versatile and a real pleasure to drive, the Mercedes-Benz Vito is a mid-sized van with a lot to offer. Available in a variety of bodystyles including panel van, crew and tourer, the Vito can be easily moulded to fit your business' exacting requirements. The latest models come equipped with a host of advanced technology features, while the range as a whole provides a comfortable and safe working environment. Come to CC Cars Limited today and discover more about the complete range of used Mercedes-Benz Vito vans in stock. Take the opportunity to browse our latest selection of pre-owned vehicles here on the website before contacting a member of the team to arrange a test drive in the model of your choice.